Makeda, is a nine years old girl who lives in Ethiopia, in a mid-size town 30km from Addis Ababa. She was born with cerebral palsy but despite this she attended school for a year and half, carried there on her mother’s back every week day, morning and afternoon. Unfortunately, when she became too big to carry any more, and when her mother was forced to go out to work to earn an income, Makeda was unable to continue at school. Staying at home and not being able to meet and play with her friends left her sad and angry. It was at this point that CRED partner Berhan Lehetsanat (BL) appeared on Makeda’s scene. Read on to find out just what a difference BL made in Makeda’s life. One of the first things that BL did was sort out an assessment of Makeda’s needs, so that she could be given the right treatment. 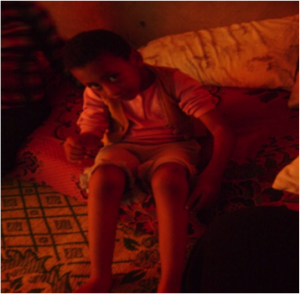 The assessment showed that Makeda had muscle weakness in her arms and legs on both sides, mild spasticity, and that she was unable to walk due to balance problems. The suggested treatment included physiotherapy to teach her physical exercises and provision of a wheelchair to help her get about more. Her rehabilitation started with some counseling so that she understood the importance of the exercises. Then, the physio taught her and her mother the exercises so that they could do them regularly. Over time, and with hard work on Makeda’s part the exercises brought promising change and Makeda changed from being angry and sad to being happy and hopeful. 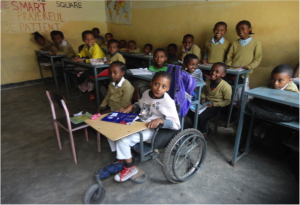 But due to the Cerebral Palsy big challenges remained for Makeda, especially regarding activities of daily living such as sitting, standing, moving from place to place, eating, dressing-up and other activities that ordinary kids just do without thinking about it. BL’s field worker continued to liaise with Makeda and her family about these, and at suitable times to bring in the physio and occupational therapist to help with making changes to the home, and learning how to approach problems in new ways so that Makeda could overcome them. The other key way that BL helped Makeda with increasing her independence, was through helping her access a wheelchair which has made a massive difference. 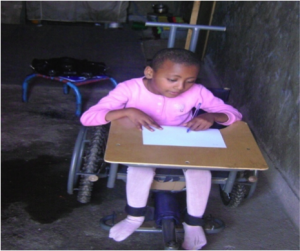 The wheelchair that she has received is adapted and has a toilet under it plus a tray-like surface attached to the arms that can help her write and also use as a table at meal-times. The final hurdle for Makeda and her family in getting to school was to overcome the resistance of the head-teacher of the school, who was determined that Makeda would not attend his school. Persistence finally paid off however. It took many visits by Makeda and her mother appealing for a place at the school, plus letters and visits from the BL staff to the school, assistance by BL staff in teaching the school staff about inclusive education, and visits and letters to the Education Authority. But eventually the head-teacher gave in and allowed Makeda to enroll at the school. At school! Makeda and her friends enjoying the opportunity to learn together at last. For Makeda this is another personal victory. Her determination to be a student of the local Primary School finally paid off. She did not let this opportunity pass her by. 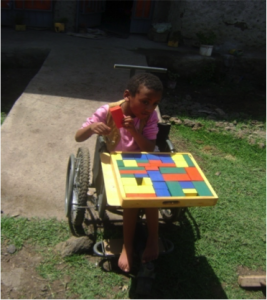 Makeda has shown that disability is not an insurmountable obstacle. Rather, she is able to demonstrate to all that disability does not hold back if one has enough determination to overcome it. Thanks to the very significant and wide-ranging input from Berhan Lehetsanat, the support of her mother, and the encouragement of her friends, Makeda’s dream has come true.